To make sure that you don't have any problems with our rental agreement, we are a truck-friendly facility. You'll be guaranteed a ground level unit with large roll-up doors. Here, you can view, download and print our rental agreement. Just click on link below. Fill out the Occupant and Alternate Sections ( a signature is not required for the alternate ) and Initial each page on the bottom right. 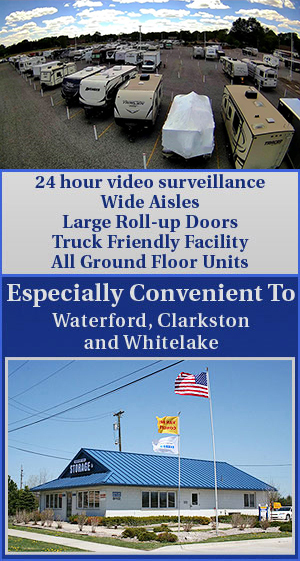 Conveniently located to serve Oakland County and Waterford, Clarkston, White Lake, Commerce Township, Pontiac, Holly, Keego Harbor, Davisburg, Springfield, Independence Township, Drayton Plains, Orchard Lake, West Bloomfield Township, Milford, Highland Township. Call us at 248-623-4000 with any questions you might have, and to take advantage of our 1 month move in special!